1 Preheat oven to 350°. Spray 2-qt. shallow casserole with no-stick cooking spray; set aside. 2 Heat olive oil in large skillet over medium-high heat and brown chicken, stirring occasionally. Stir in red peppers, onion and garlic, then Mexican Spice Mix. Cook, stirring occasionally, until vegetables are tender, about 3 minutes. Stir in 1/2 of the diced tomatoes and cook, stirring occasionally, until chicken is completely cooked, about 5 minutes. Let cool slightly. 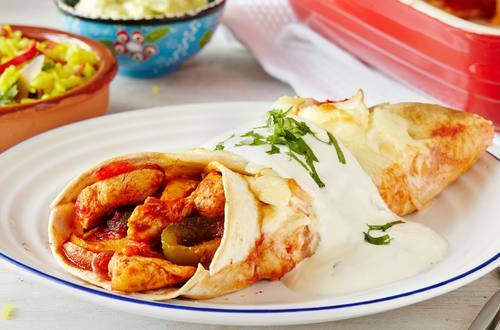 3 Spoon chicken mixture onto tortillas. Roll up tortillas and arrange seam side down in prepared casserole. Top with remaining diced tomatoes. 4 Combine Mexican crema with Hellmann's® or Best Foods® Real Mayonnaise. Spoon 1/2 of the crema mixture on enchiladas, then sprinkle with cheese. 5 Bake 20 minutes or until cheese is melted and sauce is bubbling. Let stand 3 minutes, then top with remaining crema mixture. Serve, if desired, with hot cooked rice and guacamole. *For Mexican Spice Mix, combine 1 tsp. EACH ground cumin seeds, dried cilantro and hot paprika, 1/2 tsp. dried oregano, 1/4 tsp. EACH chili powder and garlic powder. *Substitution:  Use 1 Tbsp. taco seasoning mix instead of Mexican Spice Mix.